With a reported 205 (Google) ranking factors, SEO (organic search) has no doubt become tougher than it has been in the past. With some companies strongly investing in SEO through agencies and specialist in-house teams, the question is should you be doing the same. As always, it depends on where you are in terms of roadmap. SEO no doubt is more of a strategic long-term piece of work – nobody gets to page one (the holy grail) overnight, though many have no doubt tried. However, can you afford to wait for your hard work to come to fruition – or do you need (quality) traffic / sales yesterday? If so, maybe you’re better off investing in short-term strategies such as paid search and display traffic – with the focus on retaining these customers. The sitemap above has been submitted to search engines, e.g. Google, Bing, etc. Tracking is in place, e.g. Google Analytics, Google Search Console, Bing Webmaster Tools, etc. These are what I’d consider the basics on website setup. Additionally, not following these can result in slower indexation of your website in search engines – and worst of all, possibly more work later down the line (e.g. if you need to ‘fix’ URLs, this will mean having to redirect the old URL to the new URL too). To go to the ‘next level’, you need start considering blogging, looking into acquiring backlinks (e.g. other quality websites ‘pointing’ to you), social and even user reviews. If you’re a ‘local business’, there’s now something called ‘local SEO’ which is no doubt more important than ‘general SEO’, albeit the two share a lot of similarities. ‘Local SEO’ focuses around ranking for terms that either include the area your business serves in the search, e.g. 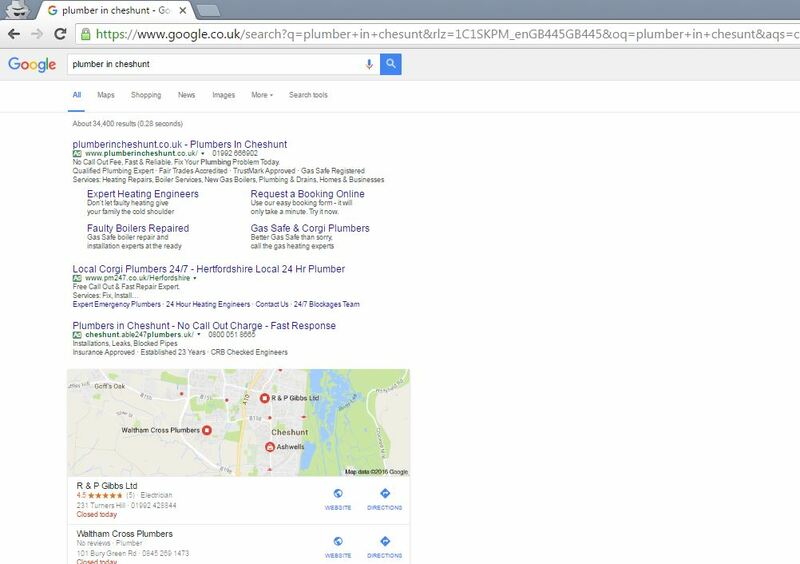 ‘plumber in cheshunt’ – or searches for ‘plumber’ made in Cheshunt itself (based on IP). After the paid results, you’ll see a map of the local area – in order to literally ‘get yourself on the map’, you need to use Google My Business (free) and Bing Places for Business (free). This is an example of ‘local SEO’ – all about being ‘local’ and no doubt, these searches are growing in popularity. However, as you can see from the screenshot above, there are three paid ads showing (maximum of four), which push the map down (below the fold) on both desktop and mobile (where more and more searches happen). Along with these two tools, I’d recommend directory listings (some of which free) as these are still commonly used to find local businesses. Regardless if you choose to ‘invest’ in SEO or not, there’s some things as listed above you should do regardless of your decision. There’s no doubt SEO is complicated, hence why many business do outsource it – but if you do, it’s important to bear in mind it is a longer-term investment and be aware of agencies who offer you ‘page one guaranteed’. In SEO, nothing is guaranteed, a realistic goal would be to increase organic traffic monthly – many forget the end goal is traffic / sales and not ranking first for terms that nobody search for.